The date was September 24, 2006, and we were in Peggy’s Cove, Nova Scotia, about 18 miles southwest of the capital city Halifax. The sun occasionally peeked through an overcast sky, and the temperature was a pleasant 62° F (17° C). A south-blowing wind was warm and light. 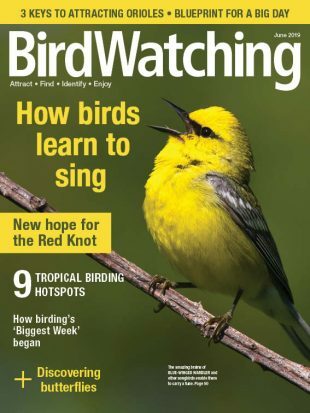 I have birded recreationally and professionally for more than 35 years across North America, and the two-note whistle was new to me, or so I thought. I heard two clear notes without harshness, but I was walking, and I know footsteps can alter sound clarity, so I let it go. My wife and I were concluding a 10-day trip through Nova Scotia and Prince Edward Island. Weary of the pace of the previous nine days, we decided to take a leisurely drive down the coast of St. Margaret’s Bay to Peggy’s Cove before heading to Halifax. Little villages dot the coastline. We saw hikers, parishioners on their way to Sunday church, and other travelers. We crested a small hill and entered the tundra-like world of the coastal headlands. The scenery was unforgettable. Granite boulders and rocky patches of wind-polished bedrock mixed with strange elfin plants. Shrubby areas with meter-high gnarly thickets of white spruce and green alder stood guard over mountain cranberry, creeping juniper, strawberry, and eyebright. Sedge and rush species ringed the ponds. Most prominent, however, was a ground-hugging crowberry-bayberry mat, which formed a green carpet among the rocks. The berries of crowberry were once popular with Eskimo Curlews and are referred to even today as curlew berry. Punishing wind, rain, salt spray, and drought create extreme growing conditions on the headlands, but when calm, the weather can turn idyllic. This was one of those rare idyllic days. True to form, a massive storm had hammered northeastern Canada just a few days earlier. An intense low-pressure system had followed a convoluted jet stream that flowed north from Quebec City to Ungava Bay and nearly reached Baffin Island before making a right turn toward Greenland. On September 21 and 22, the storm was in the Labrador Sea, pumping strong northeasterly winds on the shore of Labrador. 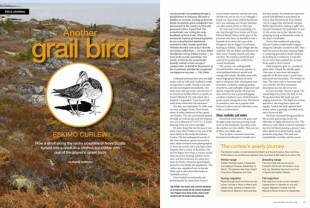 I knew that southward-migrating Eskimo Curlews traditionally stopped along the Labrador coastline in fall. 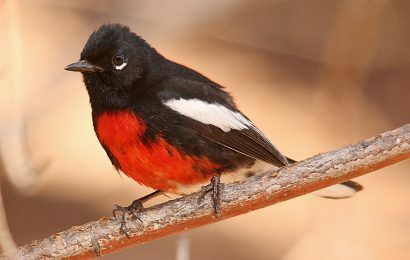 They built fat reserves for their nonstop flight to wintering grounds in South America by feeding on crowberries. Could this recent storm have pushed one or more birds south to Nova Scotia? I had stopped to gaze at a crowberry patch when I heard the whistle again. This time, it came from 180 degrees opposite of the first notes. I stood erect and raised my binoculars. The sound was clear. The notes were in harmony and very melodic. My best mnemonic description was tee-dee or tee-bee. In a few seconds, I heard it again. The sound helped me locate the bird. It was flying more than 300 yards out and angling toward me. The flight was strong and direct, the wing beats rapid and regular. I noted the bird’s general buff-brown colors, a partially extended neck, and a decurved bill. The bird continued flying, parallel to the sea and quartering toward me. Effortless in flight, the bird was fast. The efficiency with which it moved reminded me of a Gyrfalcon pursing a grouse. I was taken aback at its speed and its steady, powerful wing flaps. The neck was extended but not fully, and the prominent, decurved bill piqued my interest. I perceived no bounding motion of the body or neck. As the bird drew closer, I noted a general warm brown to buffy base color. The tail was brown, slightly tapered, and squared. The feet did not extend noticeably beyond the tail. I observed brief flashes of rich brownish color under the wings. When the bird was perpendicular to the parking area, it cornered about 50 yards out and went into a glide back to the north. Its wings were locked in a down-curved forward position similar to that of puddle ducks, and the bird tilted side to side in a flight-stabilizing maneuver. I had a brief but excellent view of the underwing color and pattern. The primary feathers were dark, grayish to dark brown-gray, but definitely not black. 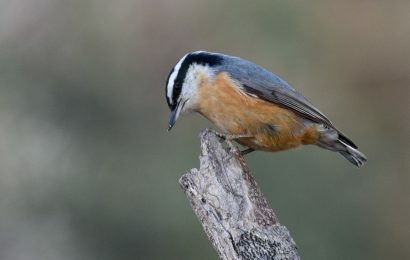 The axillaries (feathers on the underside of the wing closest to the body) and underwing coverts (small feathers that cover the base of the flight feathers) were cinnamon brown and had slight bars or smudgy streaks. Since the primaries and secondaries lacked barring, the underwings had a distinct two-toned appearance. After the tilting turn at 50 yards, the bird sailed over a slight crest, and I lost sight of it. “This bird I just saw is different,” I told my wife, “and I need to find out what it is.” I’ve observed hundreds of Whimbrels of all age classes and all seasons across North America, and I was quite sure the bird was not a Whimbrel. Likewise, I watched a Little Curlew at close range in September 1994 at Carmel, California, the fifth North American sighting of the Siberian breeder. I walked several paces down the bedrock to the north and began glassing the landscape with my 10×50 binoculars. On my third pass, I relocated the bird perched on a large rock within a few yards of where I had last seen it. It was less than 100 yards away. The bird took a few steps toward the pinnacle of the rock and then stopped, giving me the opportunity to observe it. Its overall buff-brown color was readily apparent. The bird had a relatively thin neck, a tilted-forward posture, and a thin decurved bill. It stood motionless for several seconds at a time, offering a nearly perfect side view. Occasionally it slowly moved its head back and forth. I noted field marks on the back of a flier I had in my coat pocket. The head pattern was not sharp or distinctive. I did not see a crown stripe, even when the bird changed its head position. The crown appeared darker brown than the neck and cheek but was not dramatic enough for sharp lines. I noticed a faint supercilliary stripe (eyebrow) that was most prominent above the eye and faded toward the nape. A brown loral stripe went from the eye to the base of the bill. A brown eye stripe was present, but it was lighter and more indistinct than the crown. The bird’s throat was a light cream color. The eye appeared dark, but I was too far away to determine its color. The slope of the forehead was gradual. I estimated the bill to be about two inches long (5-6 cm), thin, and slightly decurving throughout. It was mostly dark but had a flesh-colored base that was most prominent on the lower mandible. The color covered less than a quarter of the bill’s length. The neck and chest were streaked with browns over a buffy base. The back of the bird was a darker brown than the sides, but feather tips had buffy edges. The flanks were buff and streaked with browns, but the streaks were bolder and less connected than those on the neck. I did not note any V or Y marks on the flanks, but they were definitely marked with darker browns. The belly was light buff to cream and unmarked. The wing tips extended noticeably beyond the tail. And the legs were grayish. They did not show the classic blue tint associated with Whimbrels. After a few minutes of observation, the bird assumed an extremely upright alert posture, similar to that of an Upland Sandpiper. The neck appeared thinner and the head proportionally more prominent. I crossed a few yards of vegetation for a closer view. Then I glassed the rock again, but the bird was not there. I scanned the site several more times but could not relocate it. Hearing no whistles, I assumed the bird had begun foraging in the boulder-strewn landscape. I finished writing my notes and returned to our car to consult my copy of A Field Guide to the Birds of Eastern and Central North America by Roger Tory Peterson. The head and bill size of the Eskimo Curlew he painted matched the bird I had just seen, but the back of the bird I observed was slightly darker and its wing tips were slightly longer. Confusingly, the underwing pattern I saw was different than the unbarred cinnamon underwing and axillaries that Peterson rendered. His illustration of the Whimbrel, especially the underwing color and head pattern, confirmed my feeling that the bird was not a Whimbrel. The guide, however, did not show a Little Curlew, so I could not rule out that species. As a result, my initial euphoria that the bird may have been an Eskimo Curlew was tempered. I needed to check additional references. The following day my wife and I flew home to Wisconsin. I was a bundle of nerves while traveling because I wanted to review my library of field guides. Finally at home, I immediately headed to my office. I needed to see illustrations and pictures of Eskimo Curlews, Little Curlews, and Whimbrels. I started by consulting The Sibley Guide to Birds and Birds of North America by Kenn Kaufman. Neither showed Eskimo or Little Curlews, but they did have excellent Whimbrel illustrations. 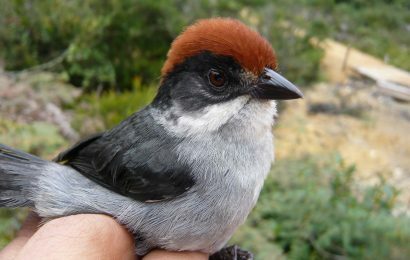 The markings on the Nova Scotia bird did not match, even the juvenile shown by Sibley. The Whimbrel bill was too thick, the color was too brownish gray, and the Whimbrel had barred underwing primaries and a distinctive separation of the supercilliary stripe from the crown. I checked shorebird guides next. I found a photograph of a Little Curlew in The Shorebird Guide by Michael O’Brien, Richard Crossley, and Kevin Karlson. The bird I observed and the bird in the photograph matched in general body shape, but the Little Curlew’s bill was smaller and far less decurved. In addition, its supercilliary stripe was bolder, the bill was flesh-colored nearly to the tip, and the flanks were not streaked. Shorebirds: An Identification Guide by Peter Hayman, John Marchant, and Tony Prater offered a side-by-side comparison of Eskimo and Little Curlew. My field notes and recollection matched two of the five Eskimo Curlew images very closely. 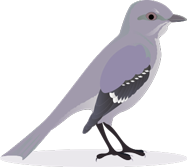 My bird appeared to be extremely similar to the juvenile in illustration 128b. The diagnostic underwing pattern in illustration 128e was an extremely close match, but the cinnamon in the axillaries on the bird I saw was more vibrant. Its throat was more cream than white, and the neck appeared more extended in flight than the illustration. When the bird I saw glided, its neck was even more extended, somewhat like an ibis. Despite the slight nuances, every detail of the bird I observed and subsequently compared with field guides strongly indicated that Eskimo Curlew was the proper identification. I checked 14 other guides that show at least one of the three curlews and searched the Internet to see if I had overlooked anything. I could not find any Whimbrel or Little Curlew illustrations, photographs, or descriptive text that defined the bird appropriately. My notes and fresh recollections best matched the illustrations and pictures of the Eskimo Curlew. I was now fully convinced the bird I saw was an Eskimo Curlew. I did not come to the conclusion lightly. I relied on 35 years’ experience as an active amateur and professional birder to document the bird without a photograph or specimen. I recorded the weather and light conditions. I recognized the singularity of the bird immediately and quickly jotted down field notes. I also systematically studied the bird from head to toe, capturing the marks as I saw them. I conferred with a field guide within minutes of the observation. Before making my final assessment on the bird’s identification, I consulted multiple references to eliminate species that could be misidentified as an Eskimo Curlew. The bird could realistically be confused with only a young Whimbrel or a Little Curlew. My field notations and recollection of details repeatedly eliminated the other two species, yet I have no conclusive proof. I have no corroborative sightings, pictures, call recordings, feathers, or droppings. 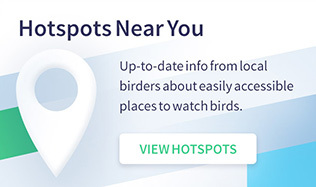 All I have is a careful, lengthy observation by me as an experienced birder. I said as much when I reported the sighting to the Canadian Wildlife Service. I understand with clarity that the claim of observing a possibly extinct species needs extraordinary proof. I do not have it, but I have confidence in my observations. A true conundrum! Scientists consider sightings of extremely rare species to be only hypotheses that require rigorous examination. My observation is scientifically weak evidence that the Eskimo Curlew exists, but when combined with a long list of other reports (see list of sightings, below), it forms a hypothesis that the species is not extinct. Only true scientific endeavor can reject or accept the hypothesis. Nonetheless, in good conscience in the fall of 2006, I took a pen and carefully made a check on my life list by the Eskimo Curlew. Hope does remain for the species. My observation has motivated me to press for continued investigations. I encourage searches, especially extensive work in Labrador in August and September, to gather more conclusive evidence of the long-sought bird’s continued existence. Randy Hoffman is a natural-areas management specialist with the Wisconsin Department of Natural Resources and a past president of the Wisconsin Society for Ornithology. He is the author of Wisconsin’s Natural Communities (University of Wisconsin Press, 2002) and of several bird/habitat relationship articles regarding the state’s breeding birds. The Eskimo Curlew was last confirmed in 1963. Possible sightings in the years since are listed here with locations and numbers of birds. Sources: Gollop, J. B., et al. 1986. Eskimo Curlew: A Vanishing Species? Saskatchewan Natural History Society, No. 17; Birders Journal, 1996. 5:109-110; Gill, R. E., et al. 1998. Eskimo Curlew (Numenius borealis), in The Birds of North America, No. 347; Rines, M., “Seventh Annual Report of the Massachusetts Avian Records Committee,” Bird Observer, April 2003; Eubanks, T. L., et al. 2006. Birdlife of Houston, Galveston, and the Upper Texas Coast. Texas A&M University Press; J. Obst, unpublished data.